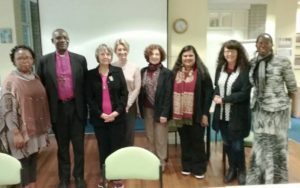 The Steering Group for the International Anglican Women’s Network (IAWN) met in London from 16th – 21st October to discuss the many issues facing women throughout the world. These women used theological and biblical perspectives to discuss far reaching issues such as gender-based violence, human trafficking, and sustainable economic empowerment. According to Revd. Terrie Robinson Director for Women in Church and Society of Anglican Communion “IAWN’s purpose is to be a bold and prophetic voice for all women throughout the Anglican Communion working to uphold the God-given dignity of women and girls, to eradicate gender-based inequality and violence, and to promote just relationships among all people.” The IAWN steering group revisited and refreshed its priorities. The group is in regular contact online but strives to meet in person once during each three year cycle. Terrie Robinson describes this as a “unique opportunity”, saying that the face to face environment allows them to plan strategically for the years leading up to the next ACC meeting. 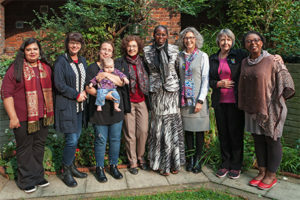 During their meeting, the Steering Group agreed to facilitate the design of a theological curriculum and signpost resources on gender-justice, to respond to gender-based violence, and to work with the Anglican Communion Environmental Network (ACEN) to promote aspects of climate justice in areas which have a disproportionate impact on women and girls, such as water justice. Along with Revd Terrie Robinson, Dr Paula Nesbitt and Moumita Biswas are part of the core team to facilitate in designing theological curriculum on Gender Justice. The steering group chair, Pumla Titus from South Africa stressed the importance of this meeting in order to prioritize its efforts for the next two years. The Archdeacon of the Northern Region in Auckland, New Zealand, Carole Hughes Steering Group Member of IAWN emphasized that the meeting was critical for the women’s relationship with each other. Promoting gender equality and the participation of women in all levels of decision making throughout the Anglican Communion. Sharing stories of women in the Anglican Communion: (i)Create safe space to encourage women to tell their own stories; (ii)Learn from the experience and wisdom that has been shared; (iii) Document and publish stories (with permission), including in the IAWN Newsletter and other media, and through sharing with other networks. Supporting and accompanying Anglicans and others who are working to eradicate all forms of gender-based violence, including human trafficking.